The meal concluded with raw fennel seasoned simply with black pepper and dressed with olive oil and then dessert or more accurately a plethora of desserts: my aunt’s Neapolitan struffoli, amaretti, panettone, torrone, panforte di Siena, almond brittle, Perugina chocolates, etc., etc., etc. So looking back on this meal, we may have had five or six types of fish and seafood, but no one ever counted. 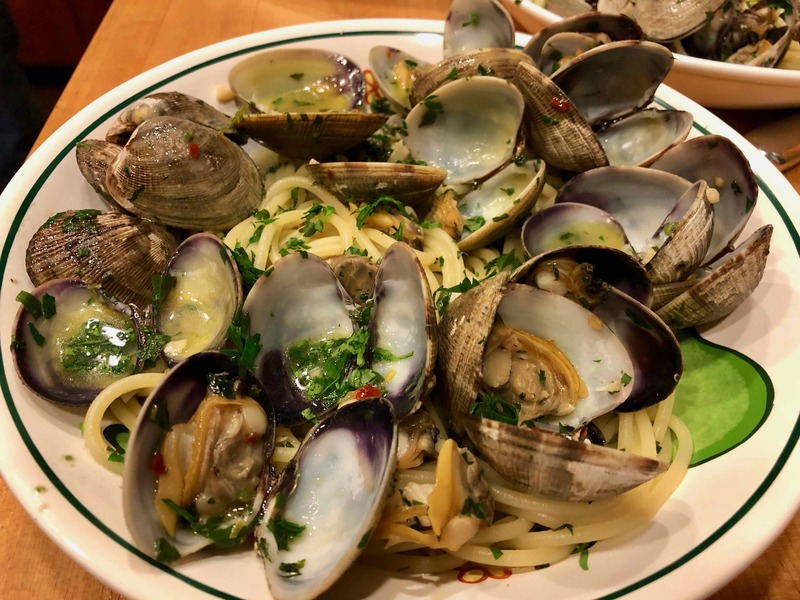 It was just one grand meal, which ever since my aunt’s and parents’ passing, I’ve continued to recreate, at least in part, every year. 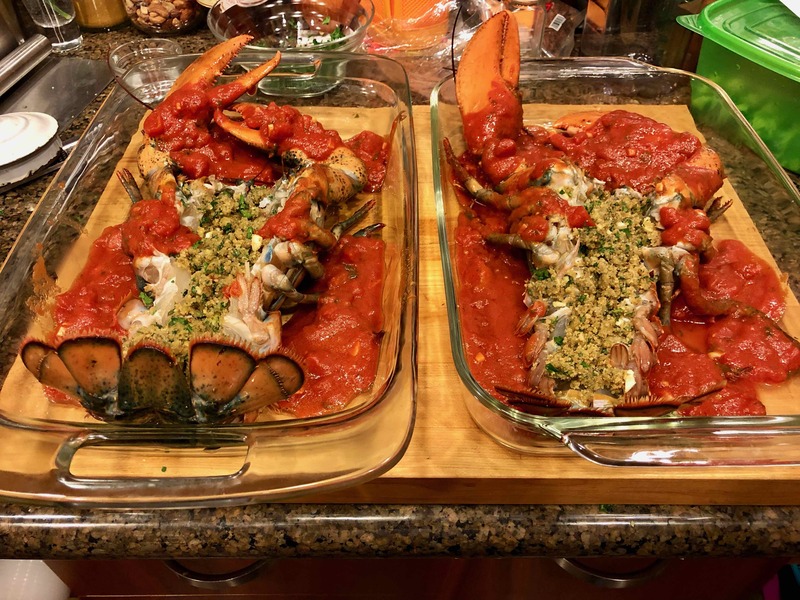 and lobster fra diavolo, the recipe for which follows. 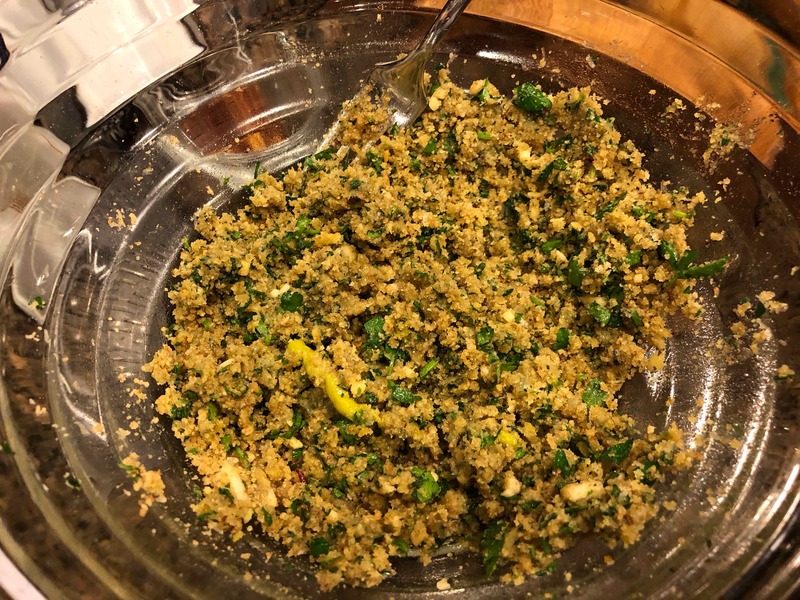 1) In a heavy bottomed saucepan, simmer the garlic and pepper flakes in the olive oil over a very low flame until aromatic (approx 5 – 7 minutes). Don’t let the garlic brown. 2) Add the crushed tomatoes, oregano, season with salt and pepper, and simmer sauce for about 15 to 20 minutes minutes. After the first 5 minutes, add the brandy. 3) Remove from heat and set aside. 1) Place the lobster shell down on a cutting board. 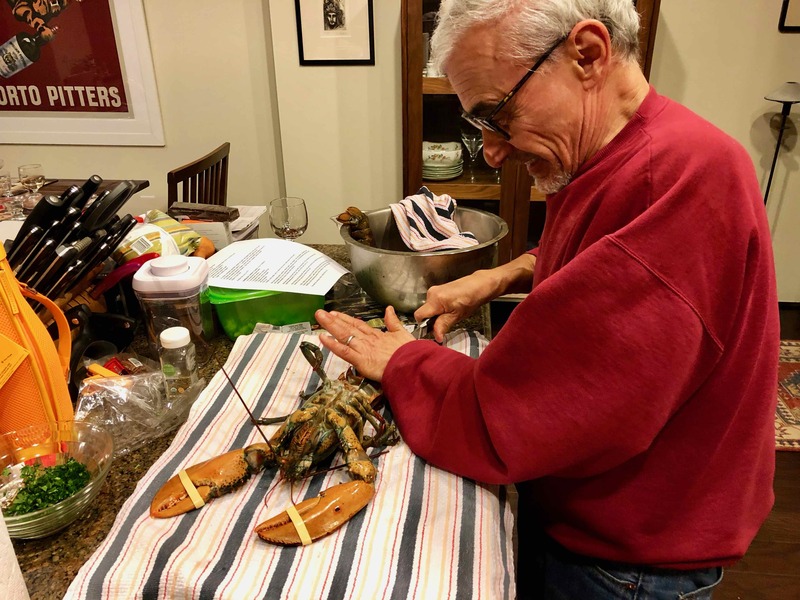 2) With a sharp knife or cleaver, split the lobster in half without cutting through the shell. Start at the head and slide your knife down to the tail. 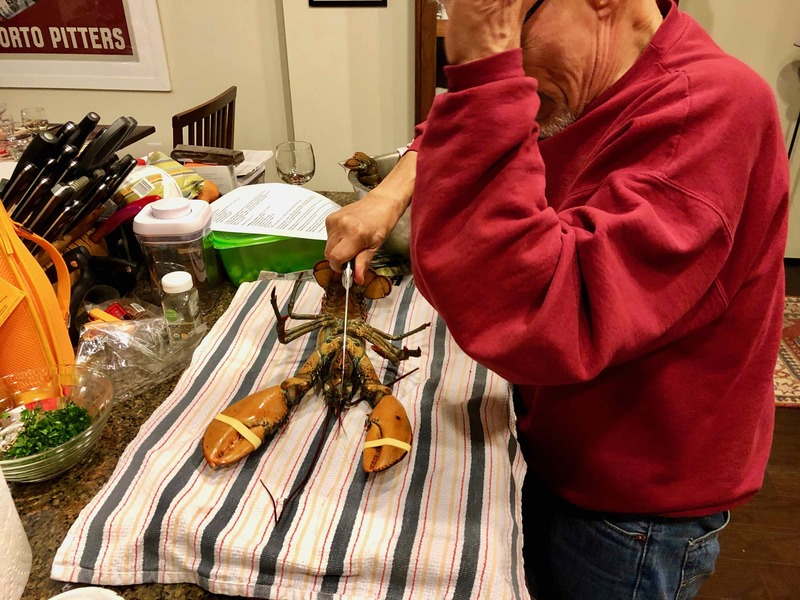 You may want to use a towel or two when splitting the lobster to avoid any mess and to cushion your hand. Just be careful. 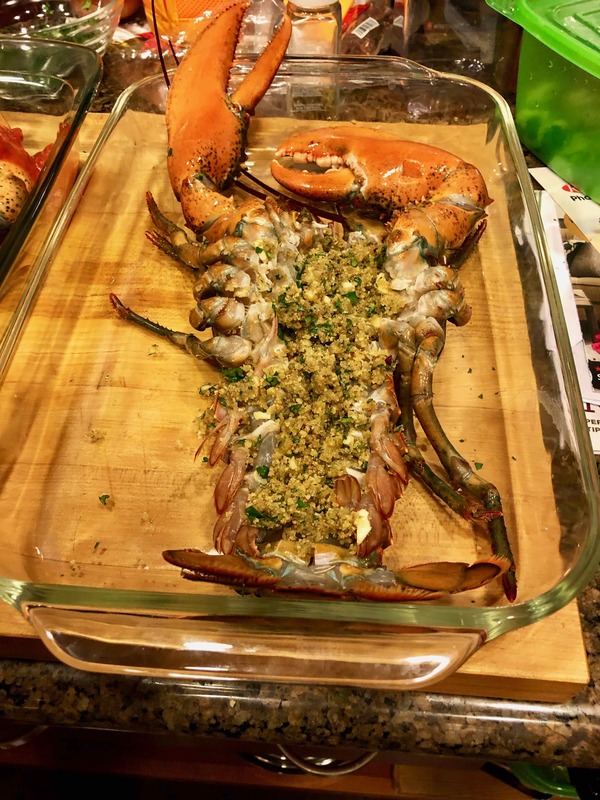 3) Finish splitting the lobster with your hands making room for the stuffing. 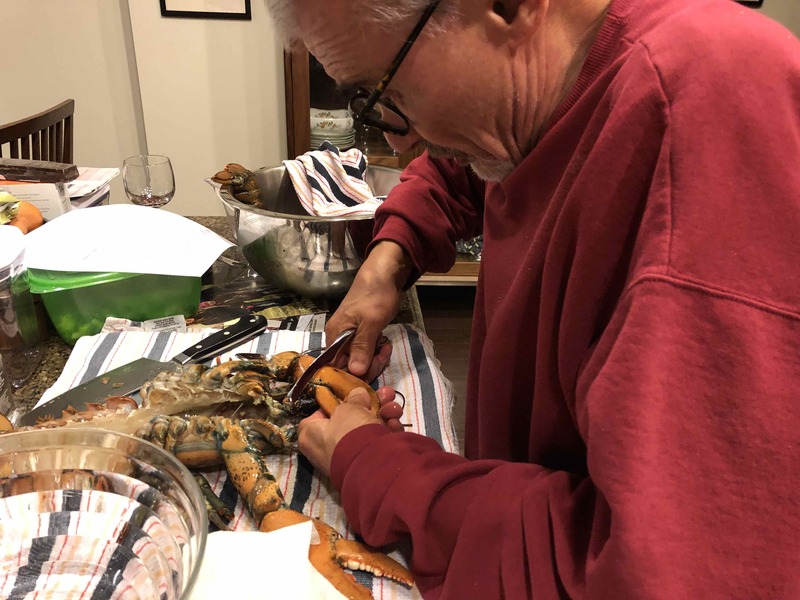 4) Crack the claws, which allows the claw meat to cook and lend flavor to the sauce. 6) Extract the sack at the back of the lobster’s head. 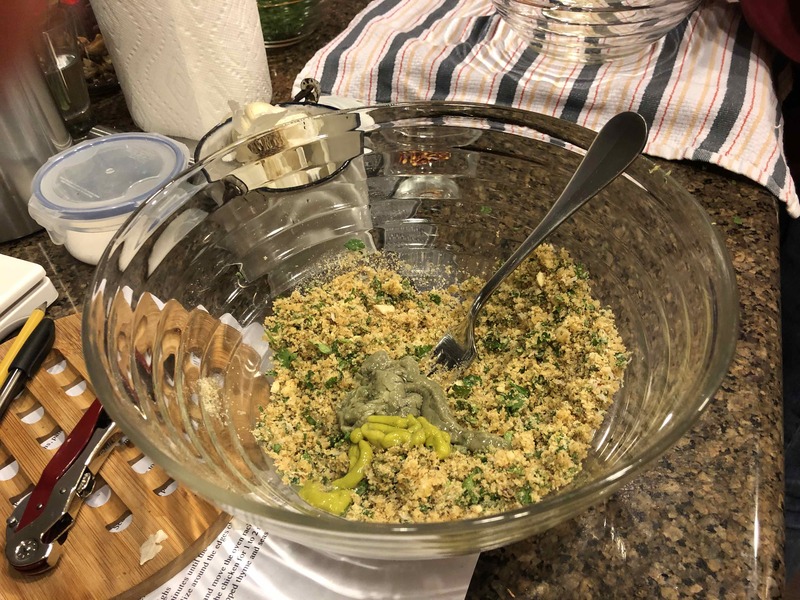 1) Mix the breadcrumbs, parsley, cheese, garlic, and oregano, salt and pepper. Gradually add just enough olive oil to moisten the breadcrumb mixture. The breadcrumbs should be just moist enough so they clump when pinched. 2) Add the lobster coral and mix just until incorporated. If the mixture is too moist, add more breadcrumbs. If too dry, add a little more olive oil. 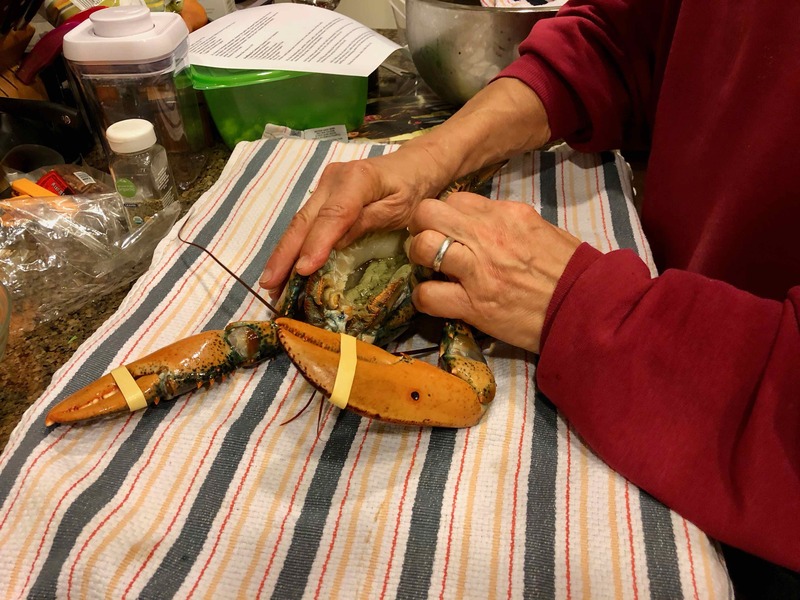 3) After killing and slitting the lobsters and removing the sack behind the neck, stuff the lobsters in the cavities in front of the tail. 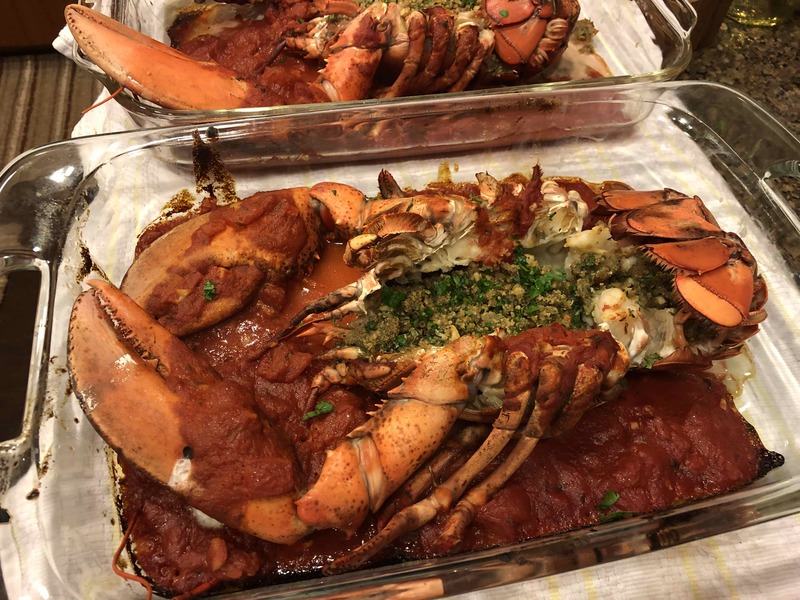 4) Add a ladle or two of sauce to each of the baking dishes Place the lobsters in the baking dishes shell-side down. 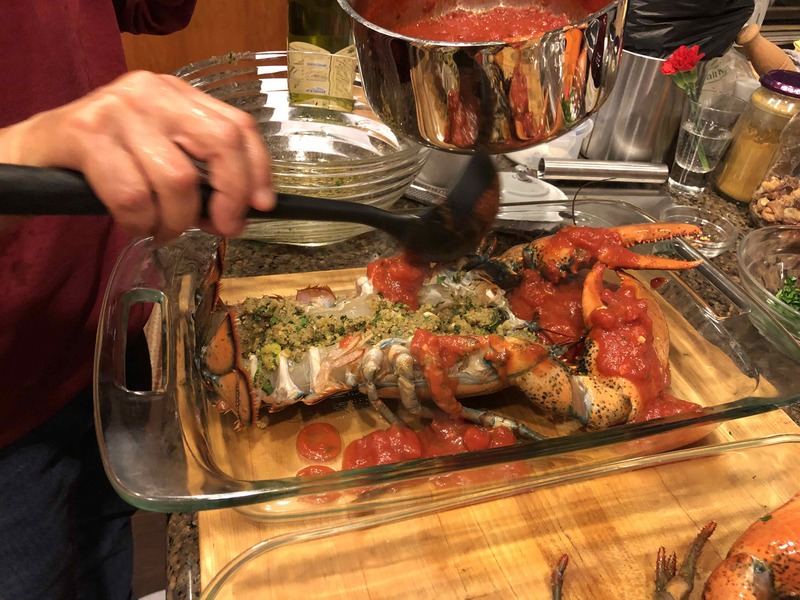 Ladle sauce over the claws and the tail meat, but not on the stuffing. Add remaining sauce to the bottom of each baking dish. 5) Drizzle the lobsters with a little olive oil. 6) Place in the oven and cook for about 30 minutes. Thanks; means a lot coming from you. But at least no longer boring and verbose.